As if it’s not bad enough to have an unpredictable rare disease with an abundance of symptoms, treatments, complications, side effects, flares, etc., another layer of frustration is added because the way you look is no indication of how you feel, so people around you often don’t take your disease seriously or even remember that you have it. When are you going to get well? At least you don’t have cancer/ALS/brain tumor, etc. You need to try exercise or supplements/oils/avoid gluten/find a new doctor/alternative medicine/yoga, etc. Why are you parking in a handicap space? You’re canceling on me/us again? I heard you went out the other day, so why not now? If after attempting to educate your family and friends and they still are not understanding, welcome them to contact us. We will be happy to discuss how Myositis can be an invisible illness and help provide them with educational materials for better understanding. Just have them use the contact form on our site. Everyone employs different tactics to handle their disease as well as how they handle questions, remarks, and advice. It is easy to get our feelings hurt and difficult for many of us with chronic conditions to get respect and support for ourselves. Since some situations render us speechless and others may cause us to lash out, it may be wise to decide on different ways of handling certain situations before the situation presents itself. My condition is chronic, it is likely to continue and even progress as time goes on. My disease does not have a cure. It is difficult to find physicians who understand my disease due to its rarity and symptoms. Treatment options are often hit or miss and none are specifically for Myositis. Patients respond differently to the treatments available. Some do not respond to certain treatments requiring various combinations and dosages to find what works best for them. Others end up with health issues due to damaging treatment side effects. Indescribable fatigue and other ailments are common with most autoimmune diseases, and for good reason: People with diseases which affect the immune system, such as autoimmune diseases, AIDs, etc, typically have elevated pro-inflammatory cytokine levels, the same cytokines that are elevated during a bout with the flu and other non-chronic illnesses. The symptoms such as fatigue, fever, difficulty concentrating, pain, aching joints which are present during the flu are often present with chronic diseases of the immune system even when the primary disease symptoms are under control. You may consider handing out a simple printed piece of information which can give a brief overview of your disease and how it affects you. You can explain that having Myositis is like being on a roller coaster. While you may feel well one day, week or month, it doesn’t mean that you will the next. Good days and bad days are unpredictable. As with everything on the Internet, there is accurate and inaccurate information, so if you suggest that they find information about Myositis, make sure you give them some reliable sites. There are websites which state that Myositis can be treated, leaving the reader with the opinion that all it takes is a little treatment and you’re good to go. While that statement is not incorrect, it is very misleading as it does not begin to describe what it is like to live with the disease. The Myositis Support and Understanding website has several tools, resources, and links, which can help you help the people who surround you educate themselves about Myositis. You can also pass along the social media sites in which MSU is active. Myositis is one of a multitude of “invisible” illnesses in which the outward signs don’t tell the real story about how limiting the disease is, how it adversely impacts people who live with it, and how symptoms are almost always present in some form or another. The fatigue, muscle weakness and pain, itchy and painful skin rashes, breathing issues, difficulty or inability to eat, etc., may not be readily apparent, therefore difficult for others to fully comprehend. Able-bodied people are likely to be puzzled that the muscles which used to lift your legs no longer work, that you can’t lift your arms to wash your hair, you can’t open a can or jar, and that you battle with ongoing, debilitating fatigue and/or pain. But it’s impossible for anyone to truly understand how any condition feels if they have never experienced it, whether it’s back pain, migraines, panic attacks, dyslexia, vertigo, etc. To make matters worse, the disease is not only invisible, but it’s chronic, a word meaning persistent, long-standing, ceaseless, unending and continuing. People normally expect that your diagnosis leads to a treatment, and the treatment leads to a cure. Unfortunately, that is rarely the case with Myositis. People don’t understand that finding knowledgeable medical care is frequently hit or miss. Treatments — if even available for your disease type – are also unpredictable, often working for some people but not for others, or helping some of your symptoms and not others. And the same treatments which may or not be effective for you and your symptoms, frequently come with undesirable and damaging side effects. And in the end, is unlikely to lead to a full, long-term remission of all of your symptoms. People with Myositis are not alone. One in 5 people in the U.S. is considered to have a disability, according to the 2010 US Census, yet only 26% of these people with disabilities use any form of assistive devices, such as a walker, cane, or wheelchair. That leaves 74% — about 50 million U.S. citizens –that have a disability that may not be visible. Other diseases, such as cancer, might be considered as invisible illnesses as the outward signs of the disease may not be evident, but there appears to be more understanding and acceptance because these types of diseases and treatments are more familiar and publically acknowledged. Even though there is a large number of people with similar circumstance to ours, so much mystery and misunderstanding continues to exist about those whose disabilities can’t be seen. 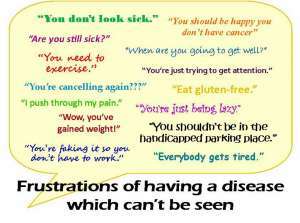 “Chronic illnesses are different. They do not follow the predictable path from warning signs to recovery.” Jackson P. Rainer, PhD, a leading authority on grief and loss. It is wishful to think that everyone who knows you will remember and are compassionate about your limitations, but it isn’t a realistic expectation, especially since you may show few or no outward symptoms. It may require frequent reminders and a variety of ways of explaining your situation. 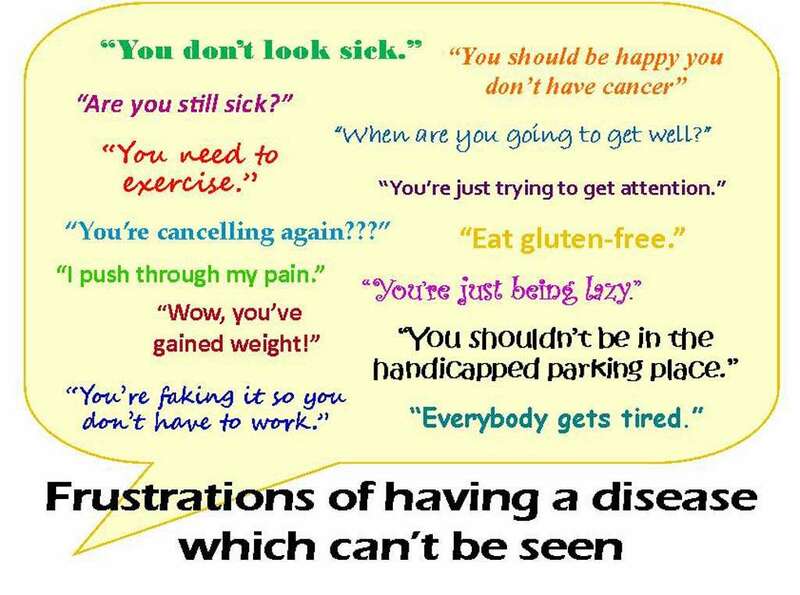 It may take patience and acceptance on your part about people’s difficulty understanding your disease and limitations because they have not personally experienced and cannot see your disease, and that most people’s advice and questions come from a place of concern. Carrying around frustration, stress, and anger can be emotionally and physically draining and unproductive. The best thing you can do is try and educate to help others understand.